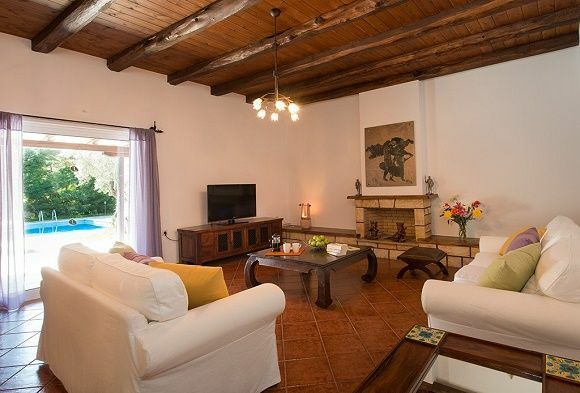 Villa accommodation with on-site facilities... the holy grail of holidays? It seems that way if the callers we speak to at BFB towers are anything to go by, and Mousses is a real gem. 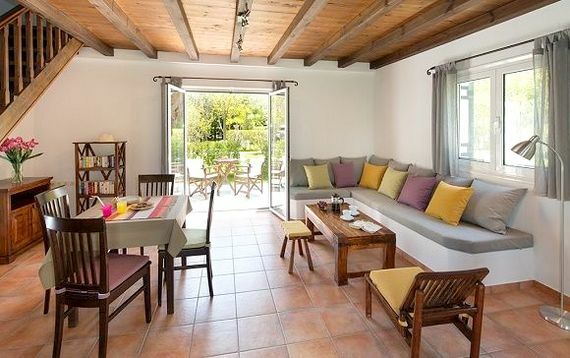 Mousses combines independent villa accommodation with an onsite taverna bar, communal pool, high quality UK-managed creche/kids club and a setting amongst landscaped gardens within walking distance (20mins by toddler trot - or more commonly a few minutes drive!) of both a sandy beach and a bustling resort centre. Best of all, some of the villas even benefit from their own private pools. 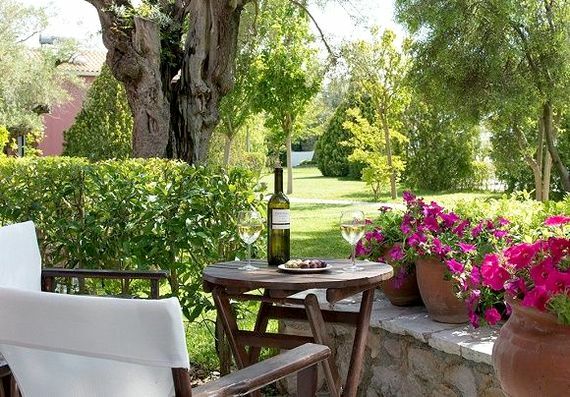 There are 12 villas in total which are set in spacious, lush grounds, shaded by ancient olive trees with plenty of space to play. The large and inviting swimming pool, surrounded by sun loungers is a big hit for parents looking to relax in the sun whilst the thoughtful shaded, shallow pool is ideal for toddlers and cautious new swimmers. The bar and taverna (Greek with a modern twist) is an added bonus and even offers indulgent poolside service. Better still, the child-friendly menu means that parents can even avoid cooking if they want, leaving them completely free to unwind! For those fancying a little more quiet time each villas has its own terrace and two of the larger villas have their own swimming pools and gardens - ideal for larger groups looking for a little more privacy. The hospitable owners Eleni and her son Zois are what makes Mousses truly exceptional. Eleni is infinitely patient, happy to chat with the steady trickle of small guests and indulge their shy requests to feed the fish, ‘help’ in the kitchen or have ‘just one more’ ice cream so families feel incredibly welcome and instantly at ease. Everything has been thought of with families in mind. 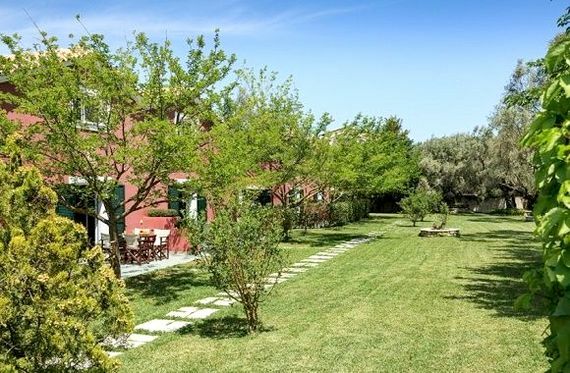 There is a weekly barbecue plus two optional evening crèche sessions so parents can enjoy some precious adult-time in nearby Lefkada town. There’s also a massage service in case guests find themselves wondering what to do all day while the top quality British nannies are looking after the little ones! Otherwise mornings and late afternoons are ideal beach times at nearby Ai Yiannis and Milos when the sea is beautifully calm (a 10-15 minute flat walk or an easy hop in the car) though many guests struggle to pull themselves away from the beautiful grounds. There are two detached villas Pollox and Castor which each have their own private pools. These villas have three bedrooms. They each have a large open-plan living/dining/kitchen area with full oven, hob, fridge-freezer, mircowave, dishwasher, TV ( Englishman speaking news channels) and DVD player. There is one double bedroom with en-suite bathroom, a twin bedroom and a second twin bedroom annex which is accessed externally or through the other twin bedroom. This room has an en-suite shower room. There is a further shower room with washing machine. These villas have private gardens with their own pools (unfenced). They are both air conditioned through out and have WiFi. Please note: The prices on this listing are based on 4 adults and 2 children. Prices include flights and car hire. 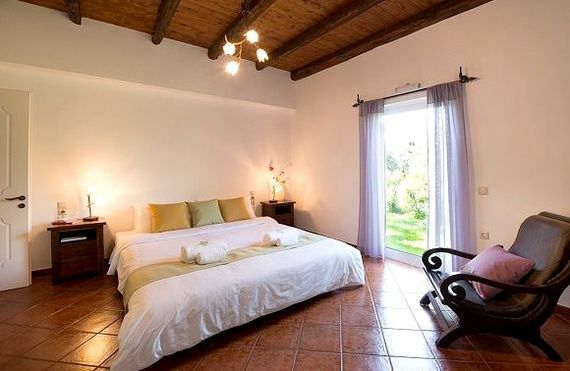 The prices may be subject to fluctuations due to changes in flight costs or which villa is available. Any price differences will be sent through to clients before any payment is taken. Infants can be selected from the options and extras page when booking (£75 per infant per week) while large or varied groups can use the 'live chat' function or email help@babyfriendlyboltholes.co.uk for an updated quote. Although enjoying a relatively tranquil location amongst olive groves on the northern coastline of Lefkas, Mousses is also pretty convenient being just a few minutes stroll from the nearest mini-market and a very short drive (3-5 minutes/ 20 minute walk) to the amenities of Lefkas town and beach resort of Agios Ioannis. 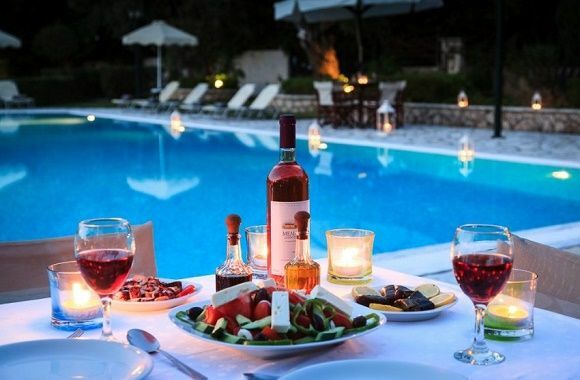 Lefkas itself has all the aspects of a quintessential Greek Ionian island with its pine-clad hillsides and long sandy coastline dotted with colourful Venetian architecture, despite the fact it is not actually an island as its connected to the mainland by a causeway. The island has a big following amongst watersports enthusiasts with surfers, windsurfers and kite surfers attracted by the strong warm breezes that brush the island in summer, often appreciated by young families as respite from the high summer temperatures. It is less developed than many Greek islands with traditional life still found inland amongst the many pretty hillside villages, although the main town itself lost much of its Venetian character in an earthquake in the 1940s, its remaining original buildings, cobbled alleyways and multi-coloured architecture ensure it is not without charm. The area around Mousses is regarded as having some of the best beaches on Lefkas. 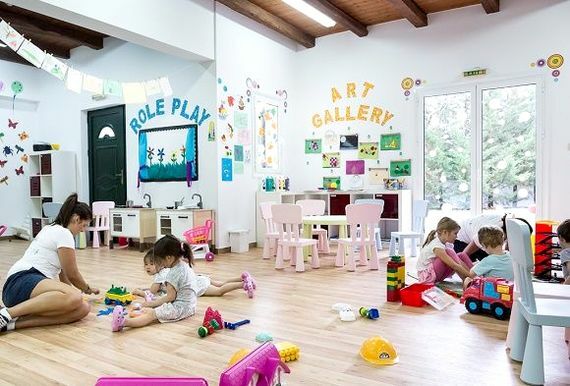 The nearest, Agios Ioannis is backed by a handy cluster of bars, tavernas and cafes, of which one is a converted windmill, which is sure to be a hit with little ones! For day trips, there's plenty of sightseeing. Don't miss a trip to the bustling yachting haven at Nidri from where boat trips can be taken to the idyllic island of Skorpios where Onasis married Jackie Kennedy. Or from Parga to Paxos, with its lovely beaches and pretty harbour capital crammed with tavernas and trinket shops. The prices on this listing are based on 4 adults and 2 children. Prices include flights and car hire. The prices may be subject to fluctuations due to changes in flight costs or which villa is available. Any price differences will be sent through to clients before any payment is taken. Infants can be selected from the options and extras page when booking (£75 per infant per week) while large or varied groups can use the 'live chat' function or email help@babyfriendlyboltholes.co.uk for an updated quote. 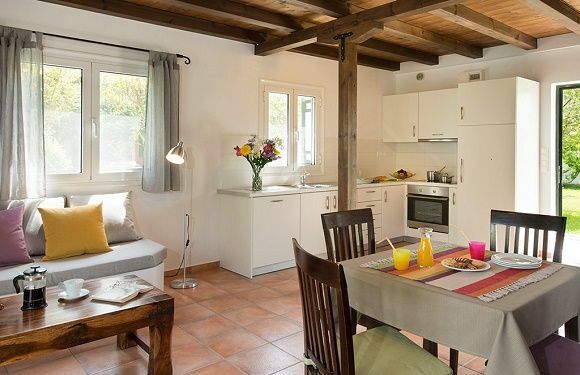 Exclusive £50 off total holiday cost for BFB users. Preveza airport is 30mins drive away. There are beautiful beaches within a short drive. Guests can walk to the coast (20 minutes walk), though families may find it easier to hop in the car. There is a taverna onsite and a mini market is within walking distance. The villas share a large communal pool and children's pool. There is a massage room with resident masseuse. Turtles Childrens Club accepts children from 4-10 years and operates five days per week. 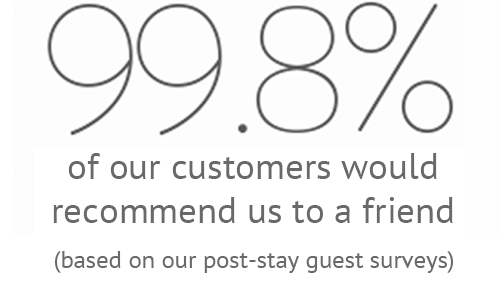 This service is charge as extra and guests can either prebook or book whilst on holiday. Complimentary infant pack includes: cot, highchair, plastic bib, bottle warmer, bottle steriliser, baby bath, nappy changing mat, hand held liquidiser, child toilet seat, potty, child toilet step, childrens cutlery plates and dishes. Where applicable the villas have stair gates, socket covers and child locks. Playpens are available on request, subject to availability. There is a selection of toys and books in the kids club/creche for children to play with. Meals can be delivered from the onsite taverna. There is a selection of outdoor toys and games in the kids club/creche for children to play with. Massage treatments can be provided on request. The Hatchlings Crèche accepts infants from 6 months to 3 years. This service is charged as extra and can be booked prior to arrival for full or half day sessions or whilst on holiday. 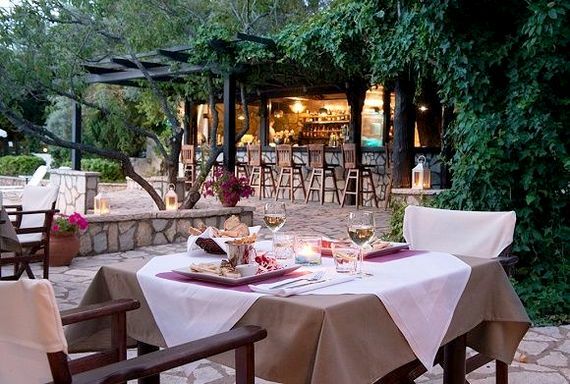 There's an onsite taverna/bar which serves fresh, family friendly meals. It is open for lunch and dinner. Meals can be delivered to guests villas. The villas have a private terrace. WiFi is available in communal areas.